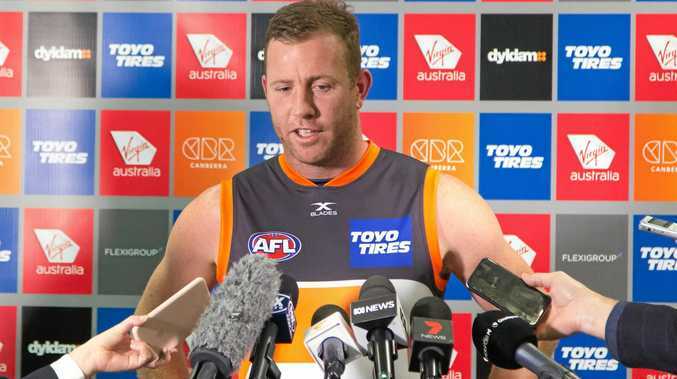 STEVE Johnson, one of the great characters of the AFL, has announced his plan to hang up the boots once and for all. But not before being a part of a fourth premiership and first with the GWS Giants. The three-time All-Australian has Johnson played 289 games since debuting in 2002 - including 253 for Geelong before he was told his time as a Cat was up. Much-maligned early in his career, the turning point came in 2007 when he capped a breakout year by winning the Norm Smith Medal as best afield in Geelong's drought-breaking grand final win. He would play in another two flags for the Cats - 2009 and 2011 - but wants a fourth with the Giants, currently second on the ladder heading into tonight's clash with reigning premiers the Western Bulldogs. "We want to have the ultimate success and I want to be a part of that," Johnson said. Johnson joins Matthew Boyd and Jobe Watson to have announced their retirements this week, while Luke Hodge, Matt Priddis, Nick Riewoldt and Sam Mitchell will also bow out. After kicking 43 goals in 22 games last year, Johnson has only managed 15 from 14 games so far in 2017. He has a grand total of 510 majors to be one of the game's greats. "I feel very content that I'll be leaving the game with nothing left in the tank," he said. "The body's been battling throughout this season. It's been a bit of a grind."